Congratulations to 88-year-old Belong Warrington resident, Sam Clark, who has been crowned winner of our Oomph! Factor competition! The Oomph! Factor competition is a nationwide competition that focuses on finding enthusiastic participants who have had mental, social and/or physical benefits from their Oomph! sessions in care homes and communities across the UK, and Sam most certainly wowed the judges with his achievements. Sam was presented with his trophy at a special ceremony at Belong Warrington which was attended by Oomph! representatives and featured a personalised broadcast news report by ITV Sports Editor Steve Scott, who judged the competition. Alongside his closest friends and family, Sam experienced a themed Oomph! session focussed around one of his all-time favourite artists, Frank Sinatra. To further celebrate his victory in style, we paid for Sam and his family to watch ‘The Rat Pack Vegas Spectacular’ show at Crewe Lyceum Theatre. Oomph! 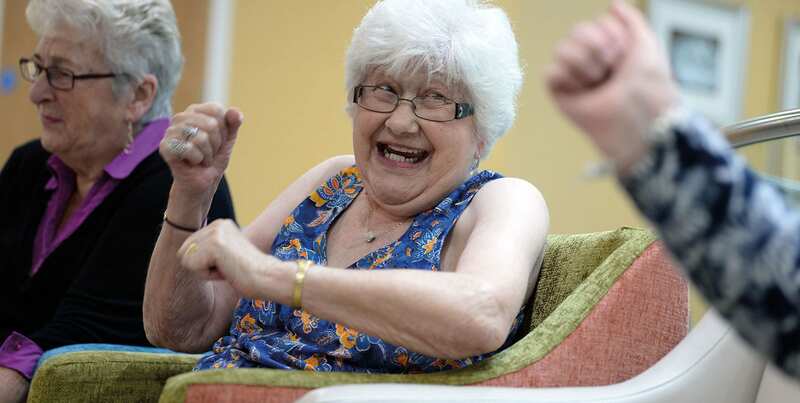 sessions are run twice a week at Belong Warrington and improve flexibility, social interaction and mental stimulation for older people through chair-based exercise to music with the use of stimulating props such as pom-poms and batons. Our Oomph! Factor competition sought to find the most enthusiastic Oomphers in the country. Candidates we’re put forward and narrowed down and after a difficult decision making process, judges chose Sam from Belong Warrington as the winner as he truly is an Oomph!-fanatic. Sam never misses an Oomph! session and is always the first person to arrive to ensure he gets the best seat. After a fall in 2016, Sam lost much of his mobility, but since attending regular Oomph! sessions and a tailor made Belong Warrington exercise studio programme, Sam is back to being the life and soul of the party and lives an active lifestyle.